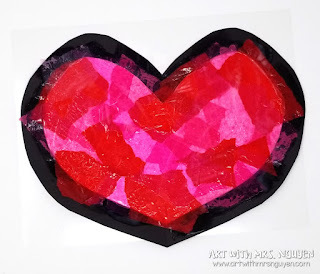 This cute project is perfect for anytime during the year, but especially around Valentines Day! 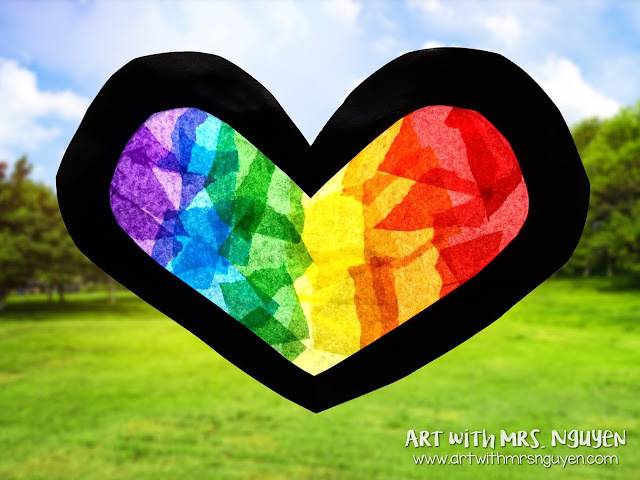 It combines the ideas of stained glass, collage, and yes - even color mixing if you want! 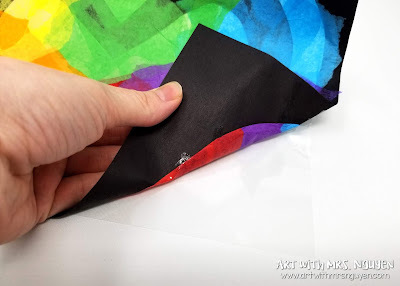 Layering tissue paper is one of my favorite ways to reinforce color mixing knowledge without using paint! To begin you'll need to create the black frame that you'll be working within to create the stained glass-esque hearts. 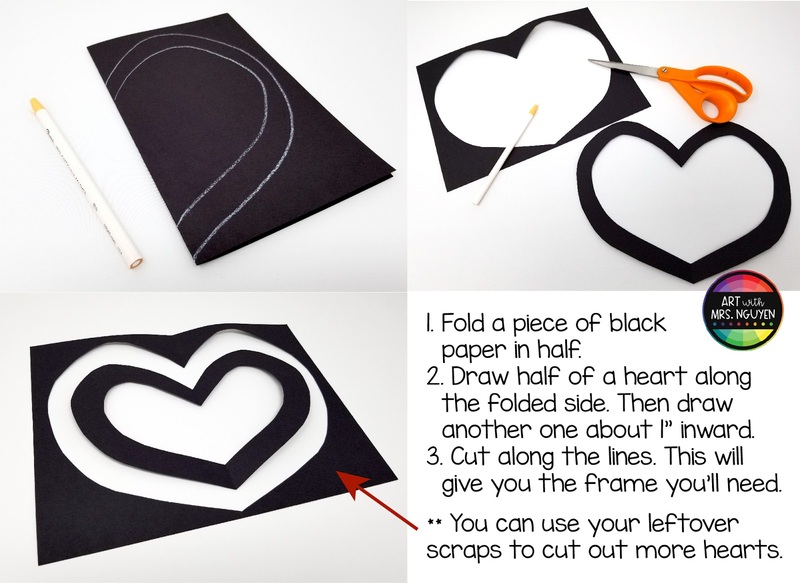 To do that, simply fold a sheet of black construction paper in half, then draw half a heart along the folded side of the paper. Then about 1" inward, draw another heart. Cut along both of these lines. Next, prepare your pieces of tissue paper by tearing them up in pieces. You don't want them to be too small or too big. The perfect size would probably be between 1-2" in height or length (but of course this is up to you). **If you want your art to have a more stained glass look, you may want to cut out squares to use instead of tearing. 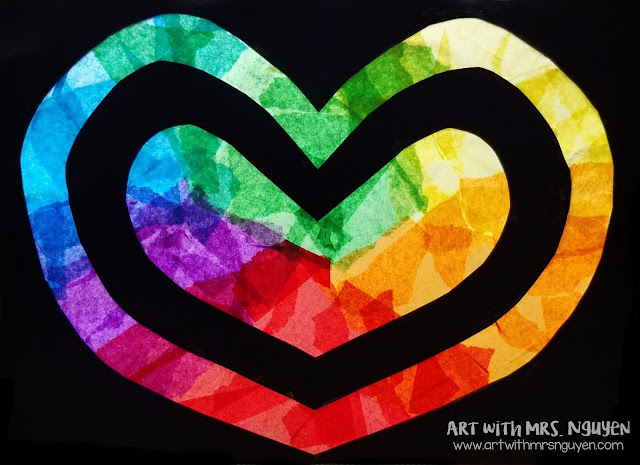 If you want to make this lesson into a color mixing lesson, try giving your students the colors red, yellow, and blue and challenge them to overlap them to create secondary colors! 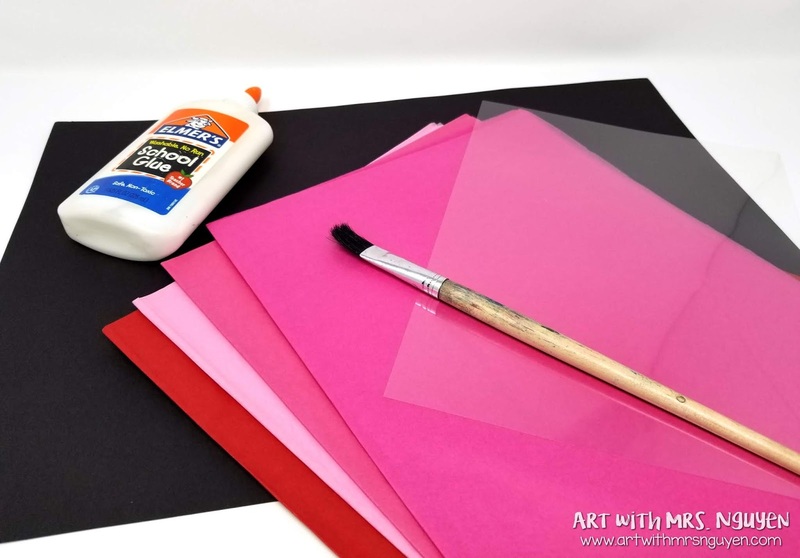 To prepare your glue solution, mix liquid glue and water into a container. The exact proportions aren't super important.. but it should be about 50/50. Once you have everything ready, it's time to get started! Lay your black frame on top of your piece of transparency paper (or sheet protector). Once students start gluing, they cannot move the transparency paper (or the tissue paper will tear). Ultimately you'll peel the artwork from the transparency paper.. but while wet it must remain exactly where it is. 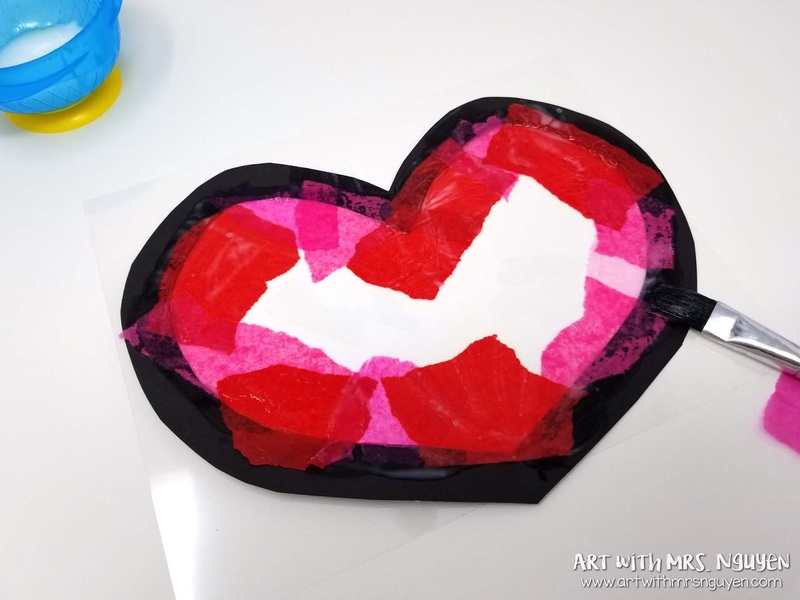 Take a piece of torn tissue paper and lay it so that it is partially on the black frame and partially in the middle space. 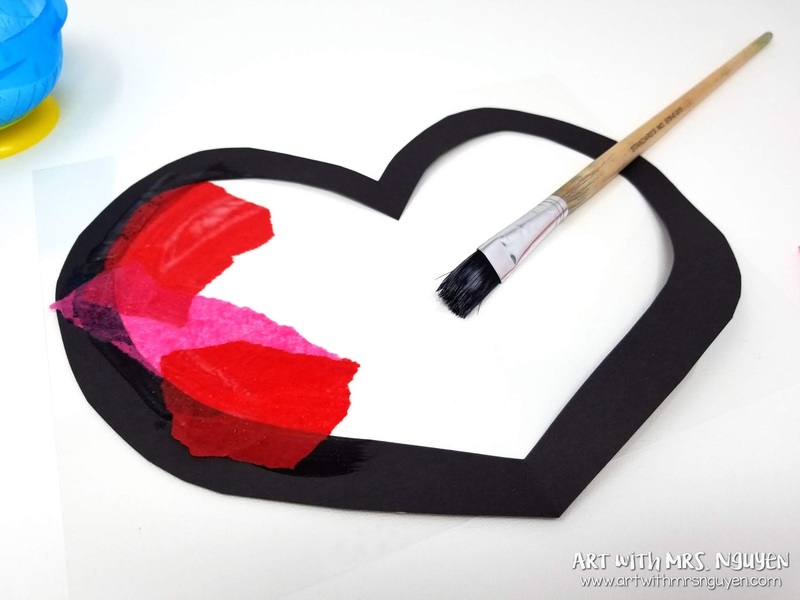 Dip your paintbrush into the glue solution and paint a layer of watered-down glue onto the tissue paper. The ENTIRE piece of tissue paper needs to be glued down. If any bit is left dry it will not hold together when it comes time to remove the transparency paper. When teaching this to students it's EXTREMELY IMPORTANT to emphasize the importance of gluing tissue paper partially on the black frame. If students don't do this, the tissue paper won't hold onto the frame. It might be a good idea to have students begin by covering the entire edge of the frame first BEFORE filling in the middle exclusively. That way you can ensure that they've covered the entire inner perimeter of the frame! Once the entire inside of the frame has been filled in, go back and double-check for any little spots that may have been missed. Look for any holes or any areas that look like they haven't been glued down sufficiently and fix them. I've found that when doing this lesson with younger students (K-1st), I often have to go back and double-check their work once they think they're done. You'll save yourself from a lot of ruined projects and heartache later if you get these things fixed correctly! Once everything looks good, put the work up to dry in a drying rack. DO NOT try to remove it from the transparency paper until it is COMPLETELY dry (best to leave it overnight). Once everything is dry, slowly peel back your work from the piece of transparency paper. If you know me, you know I LOVE any and everything rainbow! 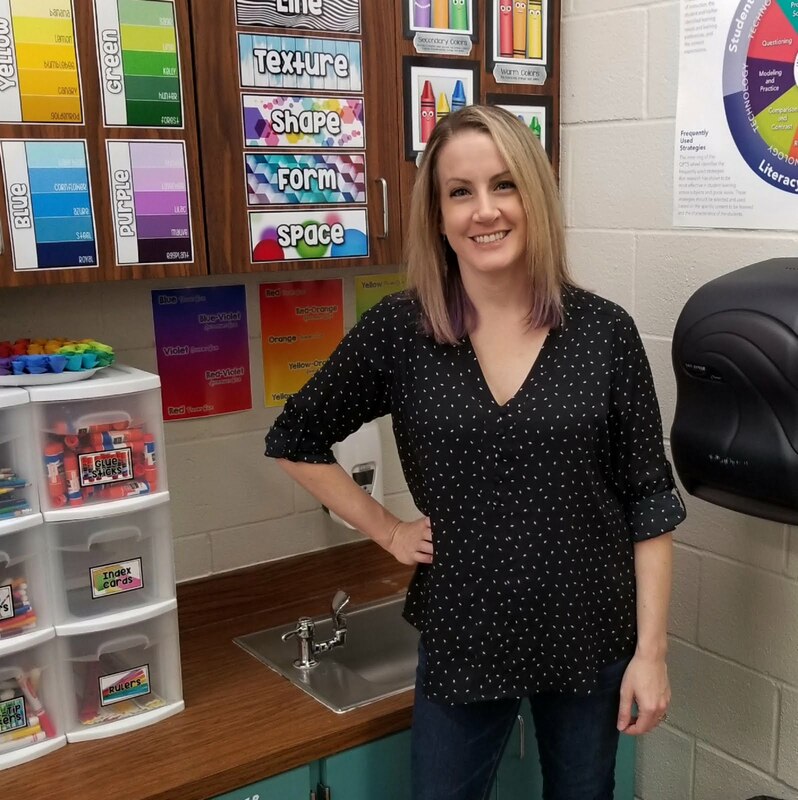 Teaching your students about rainbow order? This lesson would be a great opportunity to have students demonstrate their understanding! This was another version I tried. Color wheel-esque!